Jazz and blues is usually chord based and chords derive from scales. Therefore your grasp of scales and keys is fundamental to the understanding of chords. As long as you have a feel for jazz, those of you who have played Classical music will have a head start when it comes to improvisation. 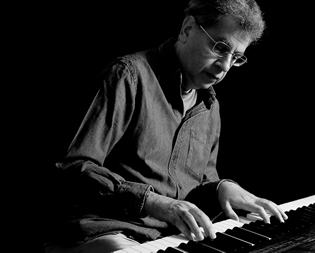 Although there have always been first rate jazz musicians that have never trained formally, it is worth noting that pianists such as Chick Corea and Keith Jarrett are equally at home playing jazz as they are playing Bach preludes and fugues. Not only could Bill Evans play Rachmaninov, he developed the ability to play a jazz standard in any key. All those out there that just stick to the keys of C, G and F, please take note. You will see from my About Me page that I earned my living as a keyboard player in bands for many years, starting out as a Hammond organ player in soul bands and moving via the Fender Rhodes into the world of synthesisers. The keyboard players that come to see me are often stuck in one mode of playing and I see my role as enabling them to expand their playing skills and ideas. I've seen quite a few over the years and it's usually the same story. They wish to understand more about what is happening musically on the other side of the desk in order to contribute in a more musical way. It's not always about aspiring to become a competent musician as much as having the confidence to articulate in a musical fashion, perhaps suggesting a different chord or key. There are also those that would prefer to be able to record the part themselves rather than always rely on others. I work with many school teachers and workshop leaders all looking for a fresh approach and new ideas. I point them towards a practical approach that stems from a fresh theoritcal understanding. I can help you with so-called free improvisation. This is not quite as free as the name implies and will benefit from a sound understanding of scales, modes and chords. You will also sometimes be asked to accompany a ‘singsong' and be expected to know some of the old tunes. This is where you need to develop your busking skills. I will show you how easy it is to play from busker books that just give the top line and chords. I can help you to understand chord symbols and how chord sequences can build into song structures that don't just follow the tired old patterns. This will allow the melodies to have something more original to say. I feel that total beginners would be better off spending time with a non-specialist teacher. You really need to know your way round a few scales before embarking on anything more ambitious.